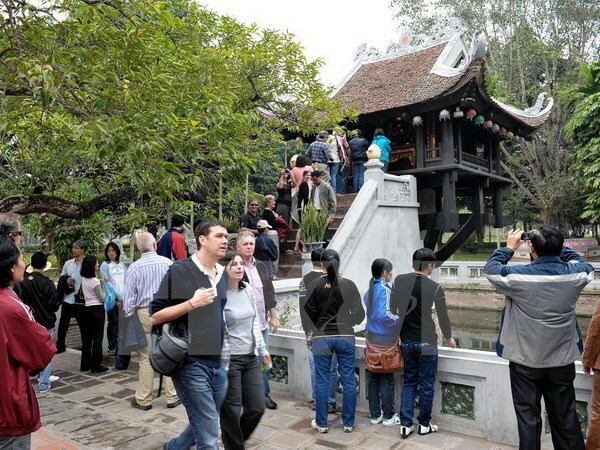 Hanoi (VNA) – Hanoi’s tourism sector is seeking to increase the expenditure of tourists in the city. According to the municipal Department of Tourism, the average daily spending of an international visitor in Hanoi is between 2.1 million VND and 2.6 million VND (91.5 USD-113.5 USD); while domestic visitors are more likely to spend an average of 1.39 million VND to 1.75 million VND (60.55 USD-75.9 USD). Compared to other cities in the region and the world, the visitor expenditure in Hanoi remains low. The figure for Dubai (the United Arab Emirates) is 537 USD; Paris (France), 301 USD; Singapore, 286 USD; Phuket (Thailand), 239 USD; Palma de Mallorca (Spain), 220 USD; Seoul (the Republic of Korea), 181 USD; and Bangkok (Thailand), 173 USD. Director of Hanoi’s Investment, Trade, and Tourism Promotion Centre Nguyen Gia Phuong said Hanoi lacks in food and shopping outlets as well as tourist products. Shopping facilities serving tourism are few in number and offer limited products, mostly handicrafts which generate low added value. The city is also unable to keep visitors for long stay due to the absence of large-scale entertainment and resort facilities. To attract more visitors, Hanoi is accelerating work on several big entertainment and tourism sites, while supporting the development of products at traditional attractions such as Co Do painting village (Ba Vi district), Van Tu garment craft village (Phu Xuyen district), Van Phuc silk village (Ha Dong district), Bat Trang pottery village (Gia Lam district), Duong Lam ancient village (Son Tay town), and Thang Long imperial citadel, among others. In 2019, Hanoi strives to welcome over 28.9 million tourists, a year-on-year rise of 10 percent, including more than 7 million foreigners, up 17 percent.